No, I haven’t left my wonderful hubby for a Italian man. Though, if I could live anywhere in the world it would be Venice. Of course Steve would be be going with me and I bet I wouldn’t have to twist his arm. 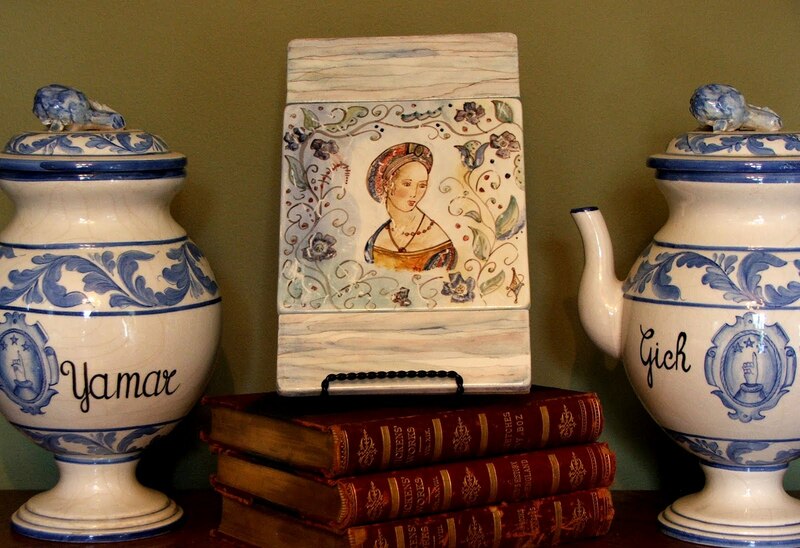 My new Italian love is this fabulous wall plaque that Gina of Gina Ceramics sent me. 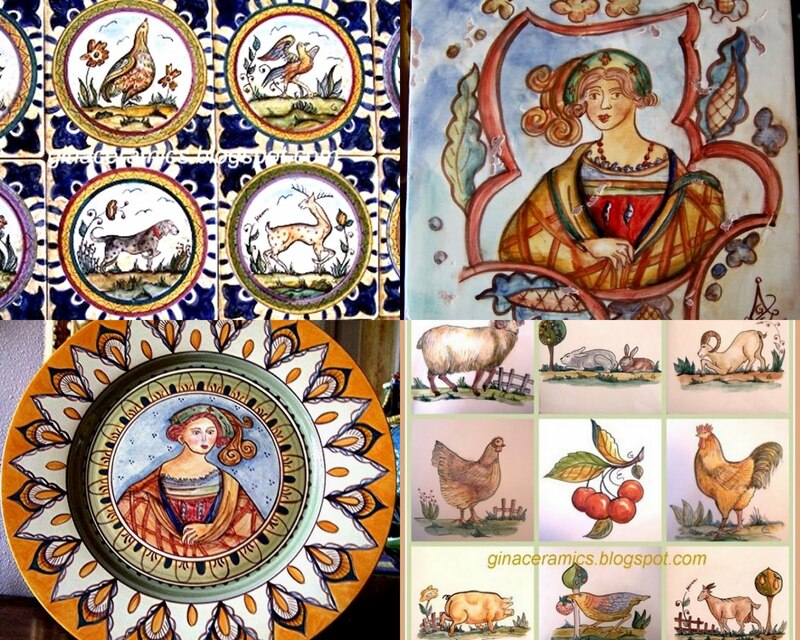 She hand paints the most gorgeous Italian ceramics in the Renaissance style. Gina was trained in Italy, Holland, Belgium and Germany and now lives and works in a small artist community in Utah. She also teaches and is offering a workshop this year on July 15-16 where you can learn to paint ceramics in the 500 year old Renaissance style. This workshop would be a dream come true for me and I would jump at the chance if the dates didn’t conflict with our already planned vacation. I hope to attend one of the workshops at a later date. This is the plaque Gina hand painted. Now you see why I am in love! 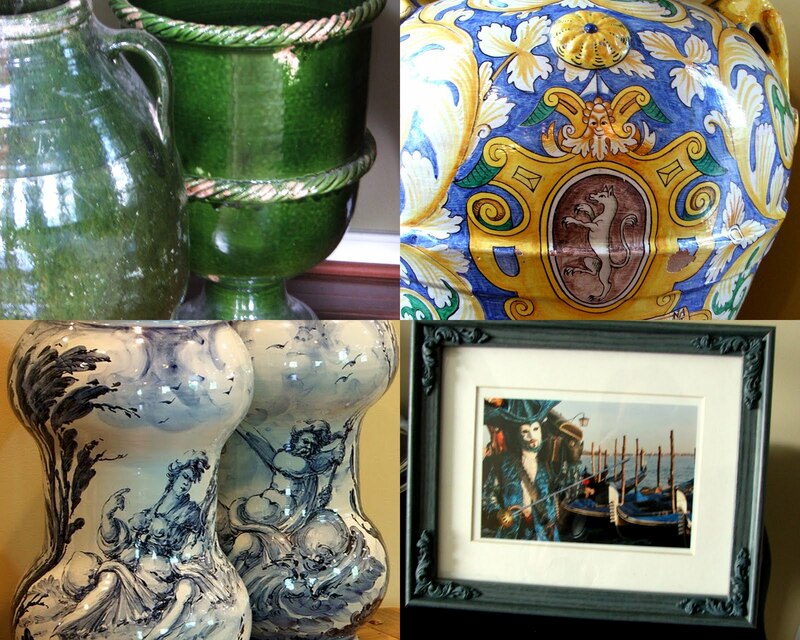 Below are just a few examples of Gina’s ceramics. To see more please visit her Blog or Etsy shop. Thank you Gina for this wonderful gift! Now that we have established my love for anything Italian I want to show you some of my collection. Some of the pieces are already packed up so I’ll show you those at another time. There is a reason I chose an Italian themed post today. We are going to Italy for our 2ND honeymoon!! Reservations are made and now we just have to be patient until August. I’ll be back later with details. She does lovely work! How fun you are going back to Italy. We were there two years ago and Venice was a favorite place of mine too. So happy for you! Didn't you marry in Venice? Ok….I am SO beyond jealous Sherry! What a fun thing to look forward to, especially with all of the moving stuff you have going on right now. That will be the perfect break from it all. 🙂 Oh, and I'm jealous of your wall plaque too by the way! So pretty! You've got quite a collection started there, so nice of her to send you such beautiful piece! I love Italy! I'm envious of your upcoming trip. Do you think I'd fit in your suitcase? I'd love to go to Italy but looks like the only place I'll be this year is the beach and the lake….oh, well, maybe some day…. Dear Sherry, What a lovely post you have written about me. Thank you so very much. 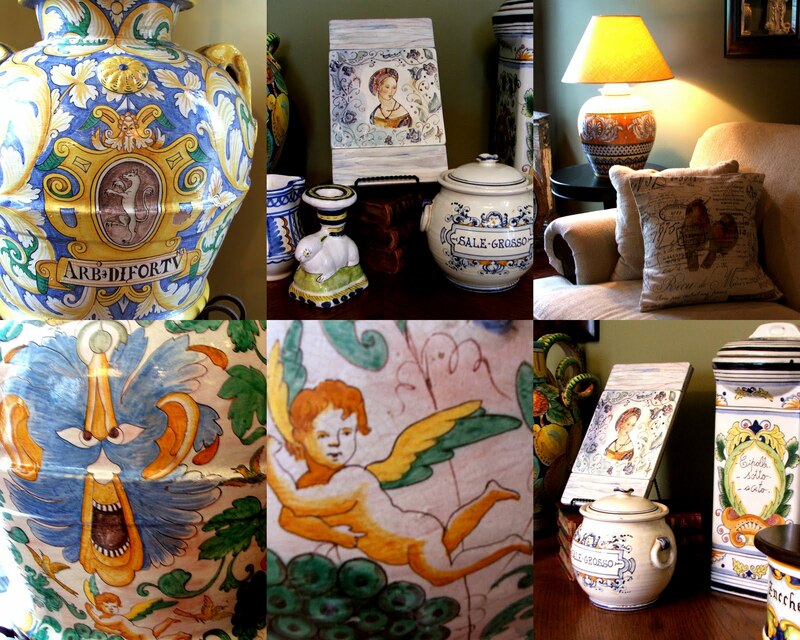 You have a very fine collection of Italian ceramics…especially the Albarelli. Now I have to see the rest of your collection. Venice is also my favorite city. We will be in Italy late September, early October. Making reservations early is part of the fun…something to look forward to. We purchased our tickets a few months ago. That is so pretty! Love the look of her work. 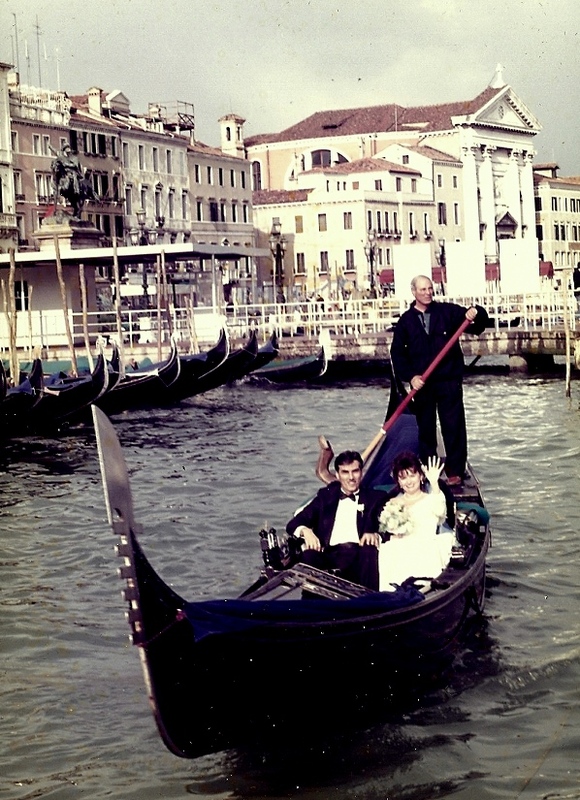 Congrats on a 2nd Honeymoon in Venice! 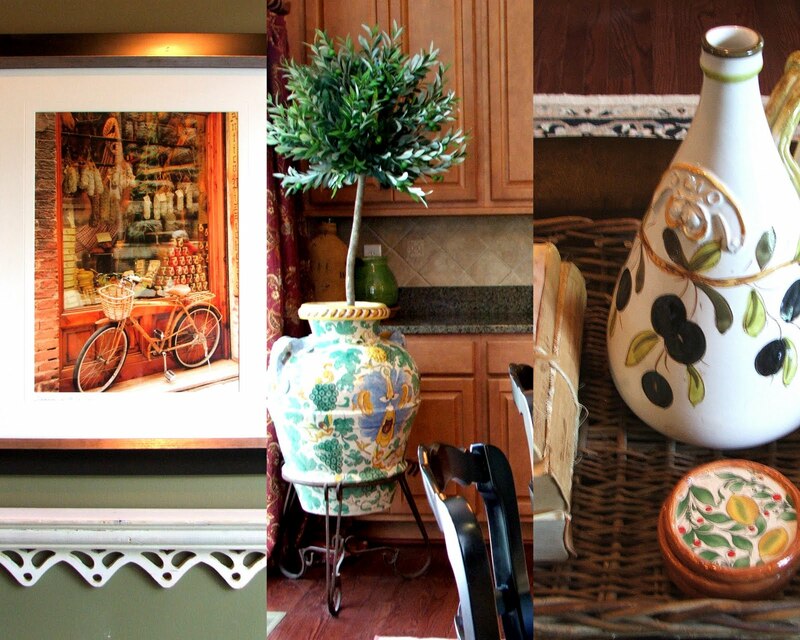 YOu have a beautiful collection of Italian pieces. I am green with envy regarding your trip to Italy. Hope you two have fun!! Gorgeous pieces. She is very talented. I would love to go to Italy again. What a wonderfully fun thing to look forward to. I hope you have a great time. I love your Italian collection! Being of 100% Italian decent, your collection has a warm place in my heart. Congrats on the 2nd honeymoon! What beautiful pieces you have. Oh, lucky you going back to Italy. We visited Venice for the second time in 2007. The square was flooded it had rained so much before we got there. Thanks for joining my party. Got to love those Italians.Almost every fun and beautiful and Romantic thing in decorating started with the Italians. Thanks for sharing your new treasures. Richard at My Old Historic House. Sherry, your friend is such a talented artist. I love that plaque! 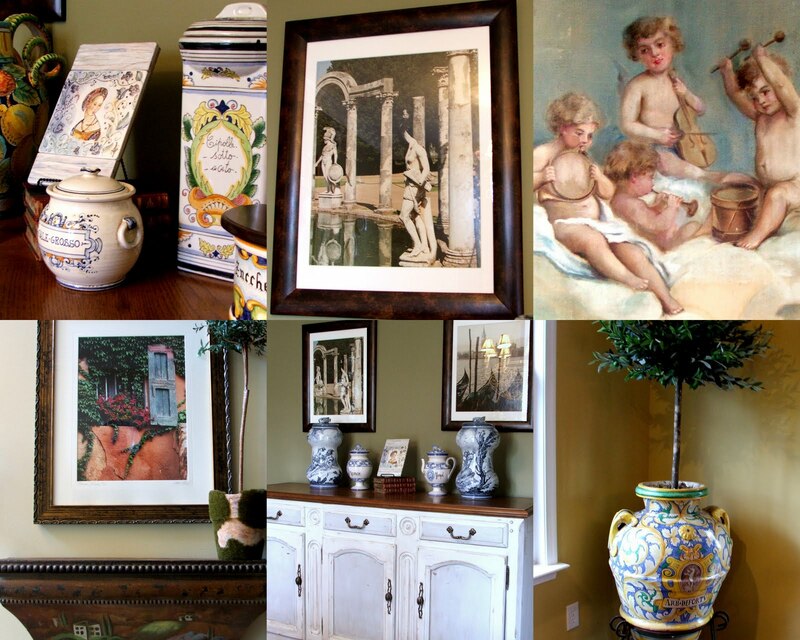 You have so many beautiful Italian pieces in your collection. What a wonderful place to spend your second honeymoon! Oh wow, a second honeymoon in Italy sounds so romantic! Oh my that is a beautiful plaque, looks like one talented artist in Gina. I love both her plaques and your collection. What a wonderful vacation for you and Mr. Hubby. Thanks for sharing Sherry, I'll go get a look at her site. What a wonderful collection Sherry! yes I can certainly see why you love your new tile. It's beautiful! Gina is very talented! Your new Italian is gorgeous. Gina is a wonderful artist! I am so happy to hear of your upcoming trip. It will be a dream! Your collages are full of inspiration today. Just beautiful…the colors are amazing. Congratulations on your upcoming trip to Italy. We really want to go there someday. I'm going to have to check out Gina's Blog….the plaque she painted is stunning. I'm thrilled for you…..and can I stow away in a large suitcase?!?! Gina does beautiful work. And you have a wonderful collection! How lucky you get to go back to Italy. I miss it and would love to go back some day too! Those are beautiful pieces! Thanks for sharing! Congratulations Sherry! We will be leaving for Italy in less than a month! It's our home away from home. Venice is magical. It's ALWAYS on our itinerary 🙂 Have a wonderful time. Gina's pottery is STUNNING! Thank you so much for sharing. A second honeymoon! In Venice! You must just be so excited! I am so happy for you and wish you and your darling husband the best. I love, love , love these tiles! I'm off to check out Gina's shop. Your collection is gorgeous! What gorgeous pottery! It is a work of art. So beautiful. It's fantastic you are going back to Italy. What a wonderful trip you will have! Enjoy! Thanks for linking this up!